Vote Leave, the official Brexit campaign, has said the dispute over new contracts for junior doctors would be easier to resolve if Britain left the EU. In the latest bizarre claim from the leave camp, the group said junior doctors’ strikes could be avoided were Britain outside the EU, because we could use the money spent on EU membership to fund better wages for junior doctors. Brexit campaigner and leader of the House of Commons Chris Grayling argued it would be ‘so much easier’ to pay for the government’s promised ‘fully functioning’ seven-day-NHS if Britain left the EU. ‘We shouldn’t be spending billions on the EU that could make our NHS better and help deal with its current challenges,’ he said in a statement. Who knew the current Tory goverment was so keen to invest in public services, and would do so were it not held back by the EU membership fee? 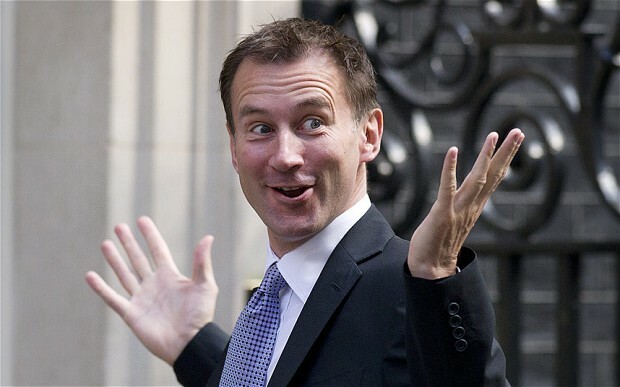 Or that health secretary Jeremy Hunt would be more willing to negotiate with the British Medical Association if only his hands were not tied by Brussels? “If you believe that then you will believe anything!” as my mum used to say. The mule-headed insistence on the imposition/introduction of an untried contract by Kenny Everett’s Alter Ego is NOTHING to do with the EU. Meddlesome Top Down Privatisation has been part of the TORY long term economic plan since whenever. There are at least 70 benefit cheats in the lower house of ill repute who have already benefited, or will get their reward, from privatised profiteers. The Health and Social Care Act 2012 is NOTHING to do with the EU, and has allowed some of the juicy bits to be hived off already. Some to tax dodging AQPs. Methinks that the outers have been a little too close to the ether. Look, our independence s much more than this kind of petty bitching. hHunt is a tiny little man and the NHS, though important, is not the issue. The big question – never mentioned, never discussed – is what the EU has planned for us all – Scots, English, Welsh, Irish – after their managed victory on 23rd June. Hunt is and always has been Cameron’s cat’s paw. He was when Cameron was currying favour with Murdoch over the BSkyB scam and now he’s doing it again because Cameron is trying to wrap up the NHS for privatisation. The job of the opposition, and that means all of them, is to make the loudest possible noise on social and traditional media to stop the ideologues tearing the NHS apart. Cameron is in hock to Murdoch, Big Pharma and all the big donors to the Tory Party. Shout it from the rooftops and hope and pray that the electorate will never forget come the next election.